- Multi language user interface, currently application available in (English, Arabic). User can select/change application language during the installation or at runtime. - Easy to install, small size installer and no need for any external framework or tool. - Easy and clear way to connect to the weight device/indicator. - Multi device support, you can add unlimited number of weight devices/indicators and switch between them easily at runtime. - It can operate with any weight device/indicator. - Embedded algorithm to prevent negative or unstable weight values. 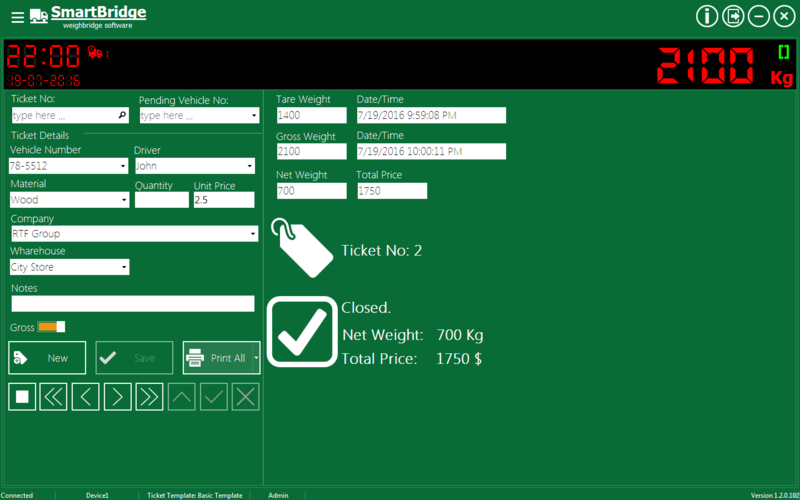 - You can design the print template of the weight ticket, you can add unlimited number of ticket templates, and you can switch between print templates easily at runtime. - Support multi users, roles. - Highly configurable software, it has many settings/options that you can adjust to make SmartBridge suitable for your business. - Easy database management, you can make database backup, restore database, or create a new database easily. - You can clear the ticket table and reset the ticket numbering without losing other data such as drivers, vehicle numbers...etc. - Highly configurable search and work report. - Support accounting and weigh fee/charge. - Export data in Excel, pdf format. - Multilingual user interface. User can select the application interface language during the installation process. Also, user can change the application language later after the installation. - Owner Name, Owner Address added to the settings. User can choose to print these fields at the weight ticket. - More enhancements to the ticket design window. - User can export, import ticket templates. Also, we have free ticket templates available for download on our website. - Option “Print all ticket fields by default” added. - User can change the database path, this will make it easy for user to create more than one database and switch between them easily.